In EARTH, we see a section of our planet’s surface (a slice of a 42mm diameter sphere proportional to the 9.5mm Moon in the third chamber) at the bottom of the sculpture. Its volume is described with lines of latitude and longitude angled so that the central line of the stacked sculpture is also the Lunar Orbital Plane. The planet volume is surrounded with a trumpet-shaped segment of the Earth/Moon gravity well. Several ballistic parabola describe human flight; beautiful arcs never quite escaping gravity’s pull. A single contrasting arc describes a successful orbit of the Earth and transfer orbit into a lunar trajectory. 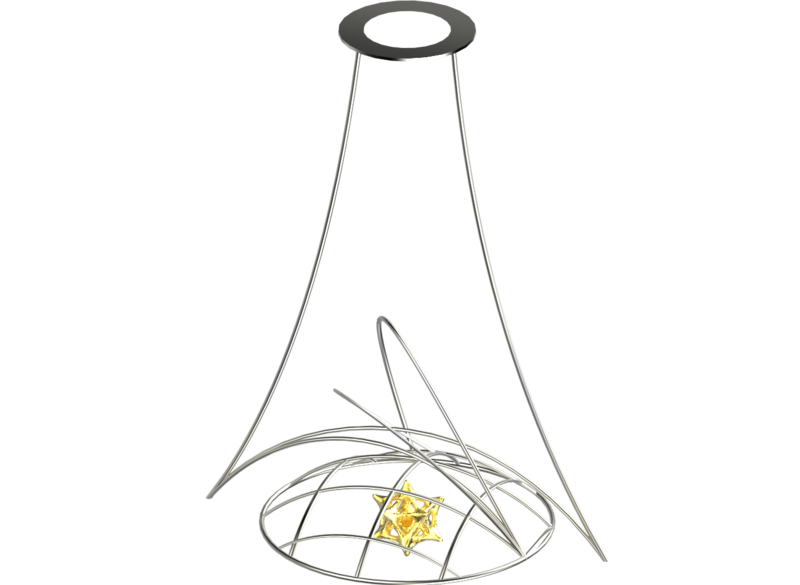 The diamond in this chamber is mounted in the hub of the bottom diamond disk, reflecting our starting point as well as the persistence of our Earth-bound nature.